On September 5, Britain indicted two Russian agents for trying to kill a renegade former spy, and vowed to bring them to justice if they ever step foot off Russian soil again. London quickly followed up by asking Interpol to post international arrest warrants for the two men, and plastered their faces across the internet. But the global manhunt for two spies may be the least of Russia’s worries when it comes to the bungled assassination. Thanks to the elaborate flourish of Cold War espionage the pair allegedly employed — spraying their target with a rare chemical nerve agent hidden in a fake perfume bottle — Moscow is facing the prospect of yet more economic sanctions. An obscure 1991 law intended to punish foreign governments for the use of chemical weapons against their own nationals has Russia bracing for yet another round of potentially brutal economic sanctions. And despite Trump’s famously chummy approach toward Russian President Vladimir Putin, his administration has little choice but to blast Russia with a new round of economic sanctions, observers told VICE News. Moscow bitterly nicknamed the U.S. "the United Sanctions of America" after the last round of Skripal-related sanctions in August. But experts expect the next stage to be even harsher — piling on to the 40-plus individual sanctions already choking the life out of Russia’s economy, according to a tally by Washington’s Center for Strategic and International Studies. Short of a convincing mea culpa or granting unprecedented access to international chemical weapons investigators, Russia has little means of escaping these legally binding sanctions. Recent history suggests the Trump administration may actually deliver. In January, the Treasury Department effectively ducked a mandate by Congress to name and shame Russian oligarchs, in what became known as the “Kremlin Report,” by releasing a meaningless reprint of the Forbes 100 list of Russia’s richest people. But after the Skripal episode, the U.S. joined the U.K. and others in expelling dozens of Russian diplomats, and in April launched some the toughest sanctions against Russia yet. The Trump administration has until mid-November to either slap Russia with more penalties or make the politically perilous argument that punishing Russia again somehow harms U.S. national security. Analysts say Trump will face political pressure not to be seen as giving Russia a pass during the run-up to the midterms in November, which come days before the deadline. When the 1991 law was written, few envisioned it might be used against a country with an economy the size of Russia’s, Graham said. Now, the twin pressures of Moscow’s aggressive foreign policy and U.S. domestic politics have merged with this little-known law to push Russia one more step down the path of seemingly endless sanctions, Russia-watchers told VICE News. Some observers now worry that, one sanction at a time, the U.S. is locking itself into a policy that lacks a broader strategy or clear, coherent goals. The White House launched an initial, smaller round of sanctions required by the law in August, covering the exports of U.S. technology with national security implications. A senior State Department official told reporters at the time that this first step may hit hundreds of millions of dollars worth of exports, including certain types of engines, heavy machinery, and electronics. The looming second step could be far more damaging, depending on how the administration dials it in, analysts told VICE News. The law requires the White House to pick at least three items of a menu of six options. Russia has adamantly denied trying to kill Skripal, who survived the attack. But those denials aren’t enough to wriggle out of the requirements of the 1991 CBW Act, which mandates conditions to lift the sanctions that, in this case, border on the ludicrous, analysts said. Once enacted, the law says that the new penalties can be removed only if Russia makes restitution to the victims of the chemical attack. The Trump administration can also opt to take a national security waiver for any of these punishments — but doing so would mean putting forward an argument that punishing Russia with tougher sanctions would somehow have a negative impact on U.S. national security. Nevertheless, sanctions have become Washington’s favored policy toward Russia, a policy it shows no sign of reversing anytime soon, political analysts told VICE News. “The different sanctions are now becoming merged among one another, which makes it much more difficult to abandon them,” said Anders Aslund, who once worked as an economic adviser to former Russian President Boris Yeltsin. “Russia keeps doing these things that make it harder for them get sanctions relaxed." This rising wall of sanctions will help ensure Russia’s economy remains “stuck” in weak 1.5 percent annual economic growth, said Aslund. He calculates that sanctions and other related problems are costing Russia up to $60 billion a year, or roughly 4 percent of the country’s economy. Ultimately, Russia’s own provocative actions are largely to blame, analysts said. “Russia keeps doing these things that make it harder for them get sanctions relaxed, or find a better relationship with the U.S., or even isolate the U.S. by splitting off European countries,” said Joshua Tucker, director of the Jordan Center for the Advanced Study of Russia at New York University. And the hits just keep coming. On Tuesday, NBC News reported that Russia has emerged as the main suspect among American investigators probing a mysterious illness among U.S. diplomatic staff stationed in Cuba and China. 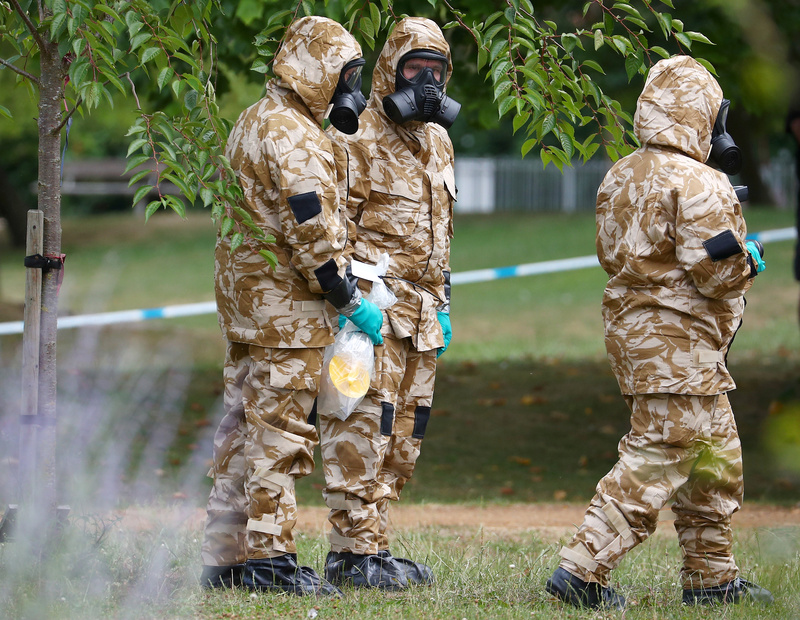 Experts on spycraft say Russia appears to revel in pushing the boundaries of what’s considered tolerable by other countries, especially the West — as in the case with the attempt on Skripal. In this case, the legal requirement for fresh sanctions actually could’ve been avoided if the alleged spies had just been a bit less creative. Aleksandr Gusak, a retired colonel in Russia’s FSB spy agency, told The New York Times last week that Russians take a harsh view of double agents like Skripal, a view that’s been publicly echoed by Putin himself. Gusak’s preferred weapon notwithstanding, the former spy unknowingly touched on the irony of this particular case: If the accused assassins had simply opted for anything other than a chemical weapon, they wouldn’t have triggered the U.S. law, and Russia’s next round of sanctions, at least, might not be coming at all.